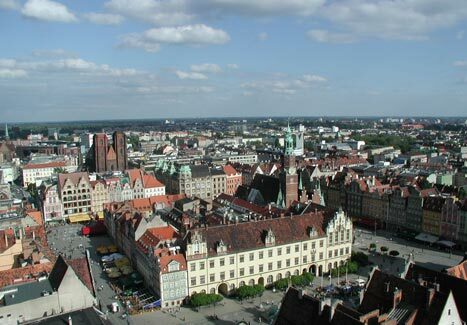 If the Old Town is the epicentre of Wroclaw then the Market Square in turn is the central hub of the Old Town. This is the very heart of Wroclaw, where the life pulse of the city can clearly be seen and felt. Here Wroclawians and foreigners alike gather to shop, dine, date, do business, or simply while away the time... For those of you who like symbolism you could say that Wroclaw's Main Market Square embodies the city's slogan as 'The Meeting Place'. The Main Square, or 'Rynek' as it is called in Polish, was laid out way back in the mists of time, in the 13th Century, after the city was razed to the ground by marauding Mongols. Since all those years ago the Square has maintained its size and shape, although the grand houses that line every side were constructed and reconstructed with each passing century and hence represent every style from Gothic to Art Nouveau. In actual fact, owing to the almost total destruction of the Market Square in World War II, all of the buildings which you now see are 20th Century reconstructions of their predecessors - painstakingly brought back to life by the Poles after they inherited the city in the wake of the war. The general consensus is that 'they done good', and Wroclaw's Market Square has never looked as resplendent as it does today. One of the largest squares in Europe and one of the most attractive, Wroclaw's Rynek often draws comparisons with the equally impressive Market Square in Krakow. Where Wroclaw's Square differs most to its Krakow counterpart is that it's middle part - the Sukiennice - is much bigger; and in fact, where once trading stalls used to indulge in commerce, you will now find four rows of brightly painted buildings split by three small alleyways. Venture into these shadowy passages and you will discover lots of little treats, such as jewellery shops, upmarket restaurants and the odd bar - try Zorba for a laid back artsy vibe! Adjoining this central block of buildings is the cynosure of the entire Square - Wroclaw's Town Hall. Although construction began in the 13th Century, extensive modifications continued to be made right up to the 16th Century meaning that the hall showcases a mix of architectural styles, principally Gothic and Renaissance. The Town Hall even boasts it's own astronomical clock - eat your heart out Prague! Just beside the Town Hall is an elegant stone monument known as a pillory. Now a common meeting point for young Wroclawians the pillory's original purpose was as a place of punishment for petty criminals. In fact public flogging and other forms of humiliation were still practiced here in the 18th Century. In fact, according to Malgorzata Urlich-Kornacka, one such victim of the Wroclaw pillory was none other than Veit Stoss, the eminent sculptor from Nuremberg responsible for creating the world-famous altarpiece at St. Mary's Basilica in Krakow. Sentenced to branding on both his cheeks (we believe the cheeks in question were on his face) as well as a prison term for fraud, Wit Stwosz (as he is known in Polish) obviously didn't suffer much loss of reputation for the indignity. Find the Wita Stwosza street at the North East corner of the Square, or why not book a room in the Wit Stwosz Hotel in Krakow! Another point of interest on Wroclaw's Rynek is the seated statue of Alexander Fredro. Fredro was one of Poland's great comic playwrights, and he was amongst the treasures that made the long journey from Lwow. Fredro had the privilege of replacing the sculpture of King Frederick II which adorned the Rynek before War (poor Freddie suffered the indignity of first being buried, before later being dug up and melted down!). Two other notable inclusions on the Market Square include the replica of E. M. Geyger's rather kitsch fountain with bronze cast bear - the superstitious tourist should touch the nose for good luck, and the famous Feniks Department Store. Once the largest department store in the city, the art nouveau Feniks Store is now most famous for the missing glass globe, which was destroyed by lightning in the 1930s and has yet to be reconstructed... You'll be the first to know if we hear anything! Finally don't be fooled into thinking that Wroclaw's Market Square is just a bunch of staid old buildings! There's much more to do here than take pretty photos. Drinking for one thing... During summer the Rynek is the place to soak up the sun with a Piast beer at some of the many bars, clubs and restaurants, and during the winter a large ice rink materialises from nowhere providing you with the chance to show off some skating skills. Factor in a lively programme of concerts, folk dances, photo exhibitions and much more and you're bound to find something to entertain you! Fantastic place, will be my 3rd time in May. Love the buildings and fab places to eat and drink. My grandfather was born there and leaved the city when was 13 years old, to emigrate. I stayed in Wroclaw last june and loved it. Wonderful. Amazing city, visited for 3rd time this year and it is truly one of the best. Best city in EU ,I'll be back. Wonderful historical city, I love it!